Fast trading: helps or hurts markets? 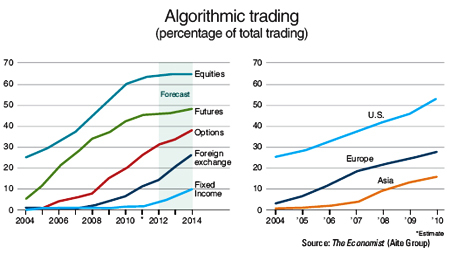 High frequency trading (HFT), algorithm-based trading done by specialized traders with supercomputers in microseconds, or one millionth of a second, has been widely practiced in the U.S., Europe and other Asian financial markets firms. ALthough small in numbers, the HFT traders move a large volume of shares and they make up more than half of all trading in the U.S. and others. 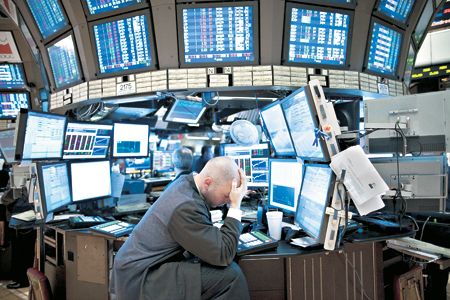 However, out of several historical glitches, the flash crash on May 6, 2010 when stocks nosedived almost 10 percent in a few minutes, has ignited global regulators’ urge to supervise these ever-faster trading practices; but controversy remains on what benefits and harms they bring to the markets. Investors claim that they’re just like other market makers who profit from the difference between what buyers and sellers offer or the so-called, bid-ask spread, thus providing liquidity to the markets. A market maker is a firm that stands ready to buy and sell a particular stock at a publicly quoted price, according to the U.S. Securities and Exchange Commission. “In principle, it’s excellent, having the active trading means liquidity and markets need it, it shouldn’t even be a discussion,” said James Rooney, chief executive of Market Force Company based in Seoul. “However, because the algorithm is so complex, a one-in-a-million mistake can be destructive to the market,” Rooney said. Since the March flash crash in 2010, two U.S. regulators, the Securities and Exchange Commission (SEC) and the Commodity Futures Trading Commission (CFTC), tightened the monitoring system of the broker-dealers who are directly involved with the alternative trading system, a broader term for fast trading. But the governing agencies have not been able to directly link HFT as the cause of the market crash. “Markets have failed for hundreds of years, this is nothing new,” Rooney said. “Technical problems can be fixed, it is mostly the emotional part; when people become too clever for their own good,” he said. Many studies including a report by the Korea Exchange indicated that HFT provides liquidity due to the volume of trades, which shrinks the spreads, and is beneficial to all investors. In other words, the increase of fast trading helped the fundamental function of the market, which is price discovery. “It was the market structure that was the problem, not HFT per se, that caused the crisis,” said Kim Joon-seok, a research fellow at the Korea Capital Market Institute, referring to the March 2010 flash crash. For instance, the problem with the circuit breakers, which were set to pause trading for a wildly irregular price swings, didn’t fully reflect the interconnectedness of various markets with different thresholds, Kim said. But critics argue that these traders who are constantly sending and cancelling orders can manipulate the prices taking advantage of “slower” investors. For example, exchanges pay rebates to the traders who respond to the offers first, and the HFT traders can easily collect those rebates using what’s called flash orders, which is to hold its order on certain exchange for up to half a second without matching a buyer and a seller. Although the exchange fees are a small fraction of a penny, the HFT traders move millions of shares and easily earn a large sum of profits. In Korea, high-frequency trading — if roughly defined as trading between 5,000 and 20,000 shares a day — takes about 10 to 40 percent of all option and future trades on KOSPI 200 index, Kim said. But compared to other Asian leading markets including Japan, Hong Kong and Singapore, the market size and liquidity are still immature, he added. “Korean brokerage firms still have not invested in the sophisticated trading technology and hardware infrastructure required to manage the increased transaction volume that comes with speed trading,” Perez said. The Financial Services Commission’s proposal to the Financial Investment Services and Capital Markets Act last July would create the path for alternative trading systems in the country, he added.